This mod used to be a simple feature from Gany's End but by popular demand I decided to release it as a separate mod. -All of the heads added by this mod are wearable! -MOBS! Find your favourite modder/youtuber/streamer/friend as a mob in the world! But careful, they don't like you! (and I don't blame them, look at yourself). 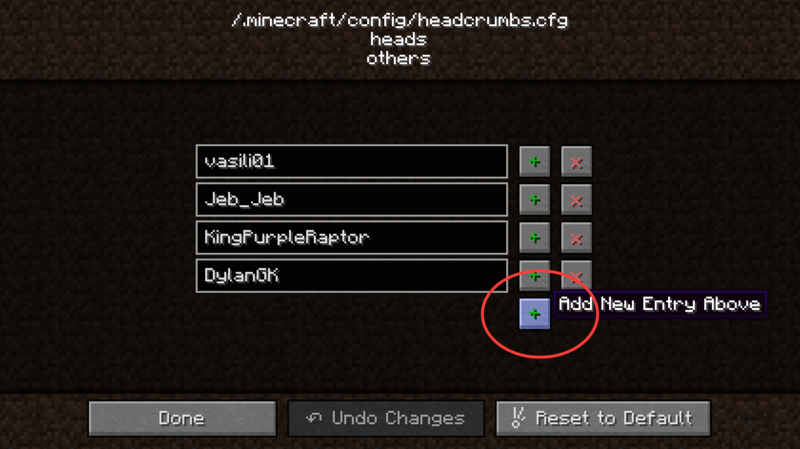 Any names added to the config file will also spawn in the world! 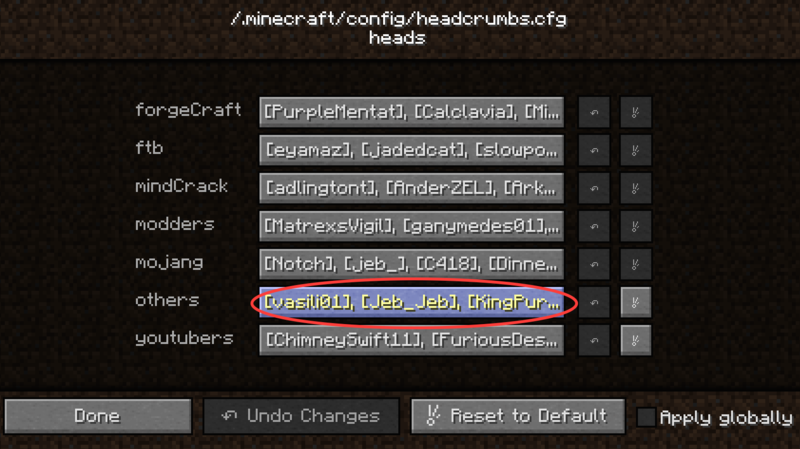 You can, of course, remove and add names to the celebrities list at any time using the configs! You can also make player statues by crafting a player head with 2 clay blocks underneath it!!! Q: Can Headcrumbs's heads stabilise Thaumcraft's infusion? Q: Does the beheading aspect from Tinker's Construct influence on the head drop rate of Headcrumbs? You can use this in any pack public or private. Don't ask for permission, you already have it. You are also allowed to modify the mechanics of this mod in any way you want (recipes, ore dictionary names and etc), as long as it's done by a third party mod and keeping this mod file intact. 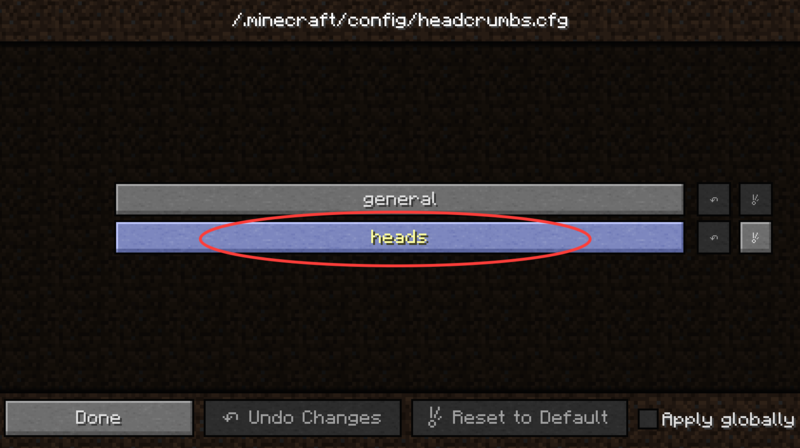 Since I've noticed some people are having difficulties adding and removing heads using the config file, I decided to write a quick tutorial for it! With the mod properly installed, load up minecraft (duh). In the main mene, click the Mods button. It will open up a menu with a list of names of all the mods you have installed. Find Headcrumbs on that list and click on it! The Config button will show up on the bottom of the list, click on it to open the next menu. Once you click on the heads buttons a list of categories will show up, It doesn't matter which category you add your usernames to, I only have it setup that way because the default list was pretty big, so I thought it would be easier to split it up. 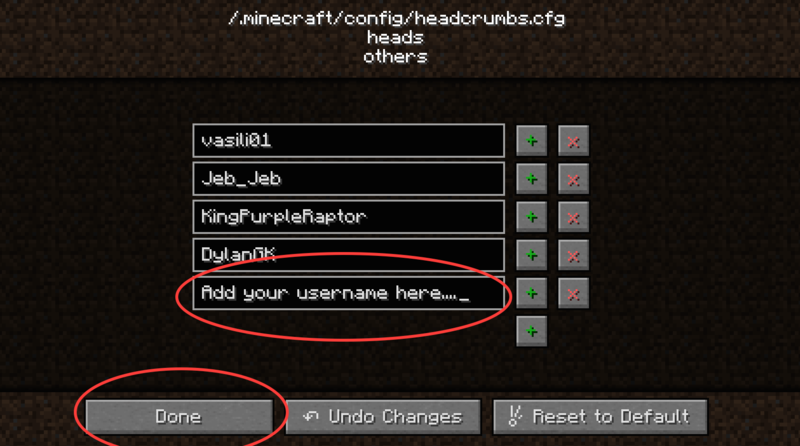 It makes absolutely no difference, when in game, the category that you add your names to. In this tutorial I've chosen the "others" category. Now that you clicked on a category you'll see the list of names currently in that category. To remove a name click on the red "X" button besides that name. To add a name click on the bottom-most "+" button. Type in the username exactly as they are (capitals matter!!!) and you're done! If you want to add or remove more usernames just repeat the previous step. When you're done click the done button and it will take you back to the main menu. You might need to restart minecraft in order to your changes to take effect. will return an ItemStack containing one head of the passed player. Feel free to use them anyway you'd like. So... can i stop all the guys from spawning around? I love this mod, but could you please add a config option to adjust the chance of vanilla, The Twilight Forest, Primitive Mobs, etc., mobs dropping heads? Once upon a time, this mod use to work with mobs from Lycanites mobs mod. 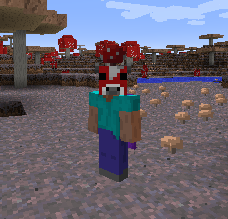 Now it doesn't, and its not even included on the list of mobs this mod makes heads for; why is that? Great mod! Tho I did get this crash on our server. 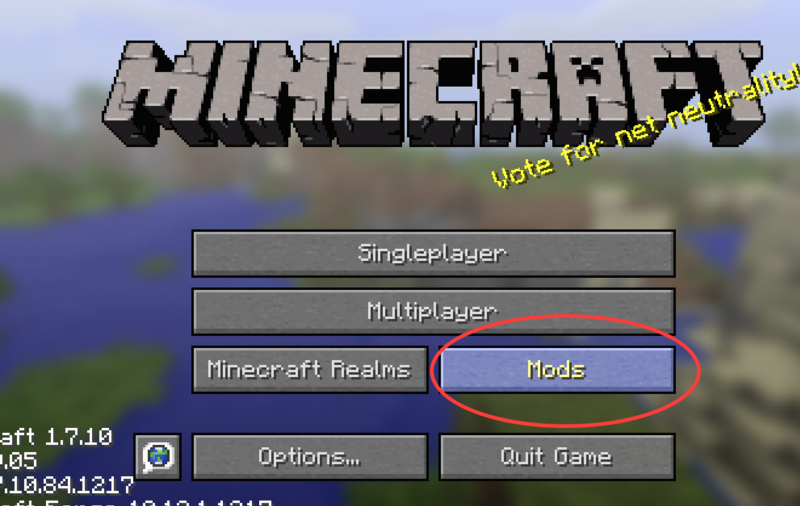 The mod is broken on 1.12.2. 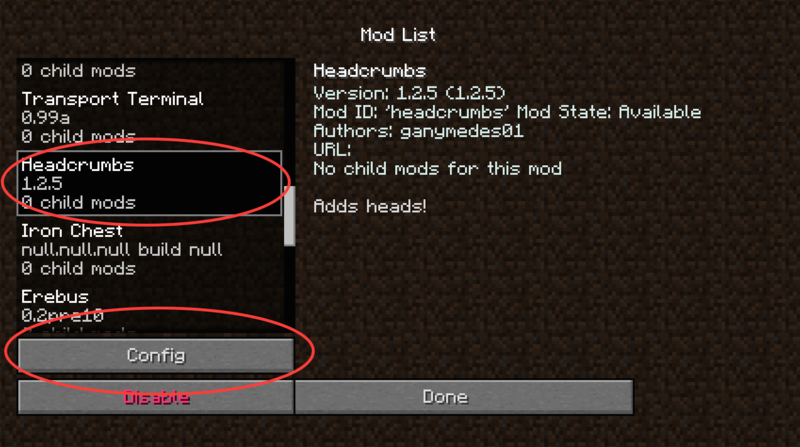 It does not add any heads from modded mobs, only vanilla heads. does cyclic's beheading enchantment work with this mod though? Hello! Testing my modpack, with sword with looting 10000, I realized that polar bears don't drop heads. Any way to solve it? Thank you! Any chance on adding heads from Familiar Fauna and Primal Core? Currently I am not adding any new heads personally, but I am open to people making PR's to add new heads! I have downloaded the most recent version of your mod, and unfortunately all the icons are steve heads. There is no model nor texture when the head is worn, or placed and if in hand it just shows a flat steve head being held. P.s. This is the first issue I have ever had with your mod, I still love your mod! Could this be a result of Animania? Is this with player heads? Ah yes, It is a known issue that Mob heads currently don't render outside of being placed in the world. This is an issue I am working on fixing and have made progress on, but due to my limited time currently progress is going slow. tl;dr. I'm aware of the issue and am working on fixing it, but I don't have a ton of time to work on it.